Will Apple TV Finally Let You Ditch Cable? This week Apple brought us one step closer to being able to ditch cable when it announced the new $99 Apple TV. With an Apple TV box, you will be able to access streaming movies from Netflix (with an $8.99 per month subscription), HD TV shows from ABC and Fox ($.99 for each episode), YouTube videos, Internet radio stations and content stored in your iTunes library. And right now, that's it. The other TV networks are balking at Apple's 99-cent price and 30-percent revenue share, and I don't see either side budging soon. Other products in the market, such as Roku and Boxee, provide all this content and more, including services like Amazon Video On-demand, TV shows from Hulu (NBC), and dozens of other channels. And the Internet Apps now being built into many TVs and Blu-ray players also offer access to these services without the need for a seperate box. 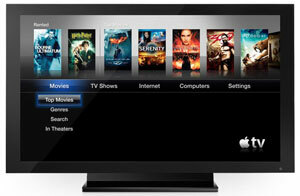 However, none other than Apple TV will allow you to access your iTunes library. And many people have a built-in library of movies, TV shows and music they’ve already purchased through iTunes. If you're one of these people, Apple TV may be of interest. You can also pull photos off your computer and create slideshows using tracks from your iTunes library for on-screen slideshows. Design-wise, the Apple TV is great, as you would expect from Apple. The sleek box is just 3.9 inches square and 0.9 inches high, and will easily fit into any décor. Set up is also simple. Just plug the power cable in, connect the Apple TV to your TV with an HDMI cable and input your wireless network name and passkey (or use an Ethernet cable to connect to your router) and you'll be up and running. Not surprisingly, the Apple TV can leverage the millions of iPhones, iPod Touches and iPads as touch screen remote controls—including the ability to input text with their onscreen keyboards. You’ll also be able to stream your music, photos and videos to all of these devices later this year using a technology called AirPlay. 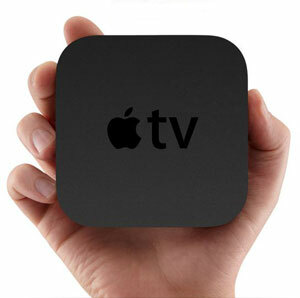 So is it a "Cable Killer"
Until more content is available for Apple TV, I don't see many making the jump. Two networks, Netflix and my iTunes library isn't going to replace the hundreds of channels available to me on cable (or even the couple dozen I may watch on a regular basis). For my own family's viewing, I would say that only about 5% is Network TV. But it is nice add-on if you don't already have a box to access Netflix and you have a number of purchased iTunes shows. And at $99, it's not a bad deal. I have a TiVo HD box that does cable, Amazon, Netflix, YouTube, and streams family video and photos from my iMac. But it’s not what I really want. What I really want is a product that allows me access to anything currently on TV (cable or broadcast) on my time, any movie (same day as DVD release) and is portable. Roku, TiVo HD, and Apple TV are all just parts of a solution. None of them is complete. However, I would love to use the $1000/year I spend on cable for other things. I also spend $20/month on Netflix (I get blu-ray discs for the movies not in streaming). I have hundreds of channels of stuff I COULD watch but would never have the time to. If I could get a season pass just to the shows I want to watch for about $20/show I would save over 50% over my cable bill. Here is an experiment that everyone should try. Cancel your cable or satellite subscription. We did just that a few months ago, and haven’t even noticed the lack of TV. True, our cancellation coincided with the summer dead zone, but we were surprised to find that we didn’t miss TV at all. Not even a little bit! Now that the new fall shows are starting up, we will buy them 1 at a time for $0.99 each, and open a NetFlix account for $9/month, and still be well under the $50/month we were paying for satellite service! @Mike Would love an update once the fall shows have started. One major limitation with the Apple TV and iTunes store is that the large majority of quality content is available to those registered with the US iTunes store. If you are abroad it can be challenging to setup a US ITunes account without a US credit card. People aren’t going to ditch their cable tv - it’s tied to their telephone and broadband for the majority of people! Hell, if you’re on verizon fios then the cable tv, broad internet, home telephone and cell phone are all bundled together! Add to that network-enabled flat screens are like in 90% of all the new tvs being sold. this means built in amazon video on demand and netflix! no plastic box with an Apple logo necessary! Apple would be wise to make the Apple TV software + app store an ‘internet app’ that’s bundled on all the new fangled tvs at best buy, target, costco, etc. Speaking of LG makes all the screens for iMacs, iPads, and apple monitors. Perhaps Apple can quickly reconsider and get itunes on the next generation LGs. Otherwise they lose the war for the living room. by my calcuation, your ‘less-than-$50 a month’ budget means you would watch only 5 hours of tv a week (42 minutes a day) + your netflix movies. The average american watches WAY more than that. The typical american would have to spend between $120 a month- that’s 4 sitcoms a day; some watch even more than that. I’m sorry I love Apple but their pricing model doesn’t make cancelling your cable tv viable. Not yet at least. You cannot stream Hulu on ANY device except a computer. The idea is eventually Hulu Plus, 9.99 a month, will stream to other mobile devices, and internet enabled TVs. Suzanne Kantra should do more research. There are bundles that include phone and internet, usually something like the “double play” ect. It is a considerably reduced price from including cable, in my case its 50 dollars less. I stream Netflix through a Roku box, get DVDs by mail, and get over the air TV. I have not had cable for many years now and I don’t miss it. I have access to more content than I could possibly ever watch. My 9 year old daughter watches shows from Disney and Nickelodian WITHOUT advertisements. My life is better without cable TV. Regarding Hulu Plus, it is available now on Samsung TVs and Blu-ray players and for iPhone and iPad if you’ve been accepted into their beta program. Bruno, I don’t dispute your math for many typical viewers. We just don’t watch that many shows at our house. My kids watch the same Pixar movies over and over all day long, so no cost there. My wife and I only follow 6 or 7 shows, and there certainly aren’t new ones every week! The rest of the time, we watch movies. I still say it’s an experiment that people should try. If you had to spend $0.99 for each show, how much crap would you sit through? mike, i agree it’s better for everyone to limit the amount of tv viewing but what is your respons to fact most people’s tv is bundled with their internet and telephone? Bruno, you raise another good point, so I’ll explain our situation a little more. I live i Canada, but I am pretty sure the information is relevant to the U.S. too. In Spring 2009, Bell Canada offered us a 1 year special package which gave us high speed internet over DSL, satellite TV and a home phone for $100 per month. Despite having a cable modem from Rogers for over 10 years, we decided it was a good deal, and couldn’t pass it up. This past Spring, the special deal was over, and Bell Canada jacked up our monthly fee to $150, so it was time to look around. We cancelled our satellite TV account in June, and haven’t missed it at all. Our home phone is now a VoIP account with unlimitel.ca, for $3.50/month plus $0.01/minute. (We already had a pay-as-you go Virgin Mobile phone which costs $8/month. The mobile is a backup in case the VoIP goes down, which hasn’t happened yet.) Soon, I’ll be switching our internet to a cable modem with TekSavvy.com for $36/month instead of the $50/month we’re currently paying Bell. So, we go from paying $150/month to less than $50/month. I have no problem throwing a $10 NetFlix subscription on top, plus around $10 - $15/month for TV episodes from iTunes. We’ll be paying half of what we were a few months ago, with better service. I believe if enough people make this kind of switch, the next time a great show like FireFly comes around, it won’t get cancelled! Apple is a business that sells hardware. Music, movies, televisions shows etc are just there to help Apple sell more hardware. Hardware is where Apple has 100% control of the profit margins. They will never shoot themselves in the foot by licensing their software (OS X, iOS or iTunes) so that someone else cannibalizes their market. Apple tried that failed experiment back in the 90s. We are along ways from Apple TV ever letting anyone ditch their cable. There simply has to be more content available. If Apple ever offers a subscription plan for shows it would be conceivable. A full implementation of iOS apps would go a long way in the right direction. Talk to some college kids lately? They would rather buy/steal/stream their content than pay for cable. Each new batch of Drexel interns I talk to — we rotate them every 6 months — say the same thing. “I can’t afford $1200/year for cable”.